John Williams (1796 – 20 November 1839) was an English missionary, active in the South Pacific. Born at Tottenham,  near London, England, he was trained as a foundry worker and mechanic. In September 1816, the London Missionary Society commissioned him as a missionary in a service held at Surrey Chapel, London. In 1817, John Williams and his wife, Mary Chawner, voyaged to the Society Islands, a group of islands that included Tahiti, accompanied by William Ellis and his wife. John and Mary established their first missionary post on the island of Raiatea. From there, they visited a number of the Polynesian island chains, sometimes with Mr and Mrs Ellis and other London Missionary Society representatives. Landing on Aitutaki in 1821, they used Tahitian converts to carry their message to the Cook islanders. One island in this group, Rarotonga (discovered by Captain John Dabs of the colonial schooner Endeavour in August 1823, with Rev. Williams on board), rises out of the sea as jungle-covered mountains of orange soil ringed by coral reef and turquoise lagoon; Williams became fascinated by it. John and Mary had ten children, but only three survived to adulthood. The Williamses became the first missionary family to visit Samoa. 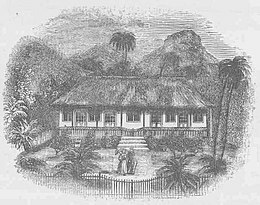 The Williamses returned in 1834 to Britain, where John supervised the printing of his translation of the New Testament into the Rarotongan language. They brought back a native of Samoa named Leota, who came to live as a Christian in London. At the end of his days, Leota was buried in Abney Park Cemetery with a dignified headstone paid for by the London Missionary Society, recording his adventure from the South Seas island of his birth. 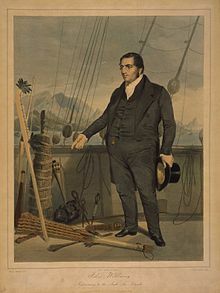 Whilst back in London, John Williams published a "Narrative of Missionary Enterprises in the South Sea Islands", making a contribution to English understanding and popularity of the region, before returning to the Polynesian islands in 1837 on the ship Camden under the command of Captain Robert Clark Morgan. Most of the Williamses' missionary work, and their delivery of a cultural message, was very successful and they became famed in Congregational circles. However, in November 1839, while visiting a part of the New Hebrides where John Williams was unknown, he and fellow missionary James Harris were killed and eaten by cannibals on the island of Erromango during an attempt to bring them the Gospel. ^ a b London Missionary Society, ed. (1869). Fruits of Toil in the London Missionary Society. London: John Snow & Co. p. 30. Retrieved 12 September 2016. ^ Chisholm, Hugh, ed. (1911). "Williams, John, English Nonconformist missionary" . Encyclopædia Britannica (11th ed.). Cambridge University Press. ^ "Wills & Admons = Pt II, KÜCK, John". q.v. Public Record Office (PRO). Retrieved 2010-02-06. ^ Wingfield, Chris (2015). "Ship's bell, United Kingdom". In Jacobs, Karen; Knowles, Chantal; Wingfield, Chris. Trophies, Relics and Curios? : Missionary Heritage from Africa and the Pacific. Leiden: Sidestone Press. pp. 127–9. ISBN 978-90-8890-271-0. ^ Powerhouse Museum. "H4686 Ship model, SS "John Williams IV", London Missionary Society steamer". Powerhouse Museum, Australia. Retrieved 2 July 2015. ^ "BBC News - Island holds reconciliation over cannibalism". news.bbc.co.uk. 7 December 2009. Retrieved 2009-12-07. Wikimedia Commons has media related to John Williams (missionary). French, James. 1888. Walks in Abney Park Cemetery. Hiney, Tom. 2000. On the Missionary Trail: a journey through Polynesia, Asia and Africa with the London Missionary Society. Prout, Ebenezer. Memoirs of the Life of the Rev. John Williams, Missionary to Polynesia."